Today sees the launch of the 5th edition of the Digital Competitive Map 2017, the research project from Contactlab, experts in digital customer engagement, and Exane BNP Paribas, the financial investment branch of the French bank. Through highly detailed measurements, the research quantifies the multi-channel status and digitisation of 32 international fashion and luxury brands. This year the map is available in a premium version, reserved for the fashion and luxury industry. It is a unique and particularly effective tool allowing for detailed monitoring of each brand’s evolution and efforts to bridge the traditional rift between e-commerce and brick and mortar shops. The 2017 panel is made up of 32 fashion & luxury brands, with the additions of Swatch and Ray-Ban. 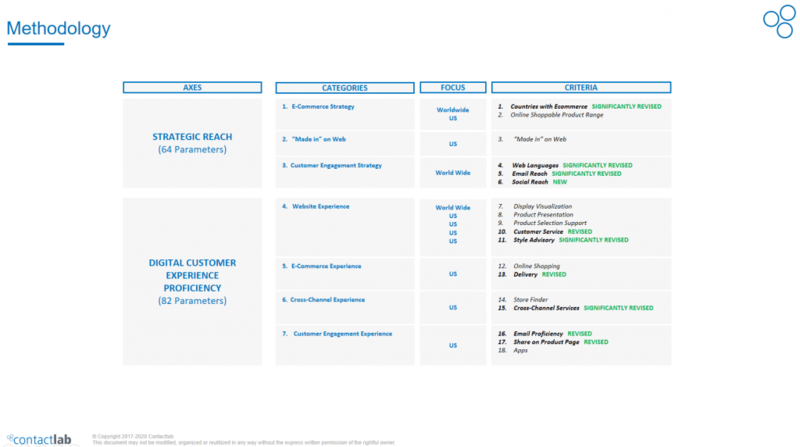 Its structure has been given a significant update: the evaluation parameters which make up the “Strategic Reach” and “Digital Customer Experience Proficiency” axes of the Digital Competitive Map 2017 have almost doubled (146 compared to the 85 of the FW 15/16 edition), the evaluation criteria have increased to 18 and special attention has been given to content localisation efforts (web, email, e-commerce) and to customer engagement strategies (social reach, customer service, style advisories). 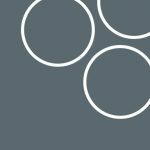 The Strategic Reach axis has global focus, while the Digital Customer Experience Proficiency axis is centred on the American market. 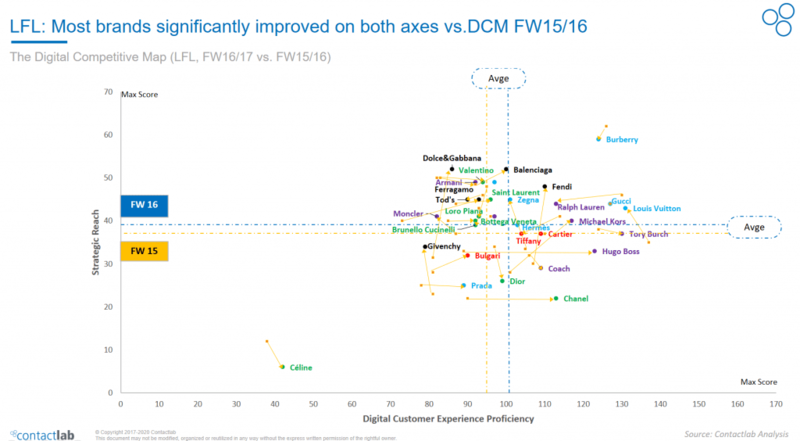 This strengthened analysis shows significant gains in performance (+12%), growing on both axes, a sign that the brands are slowly reaching the digitisation potential they hold in their hands (58% v. 55% from the last edition, the DCM16). These improved results were attained through the development of international assets (languages on the website, in email campaigns and social media profiles, with different versions by target market) and the opening of single-brand e-commerce sites in China and in other Asian nations, as well as through consumer engagement via cross-channel services (checking the availability of the product in-store, presence of the “click & collect” option, return options). The services linked to logistics, online transparency relating to “Made in”, and the ability to exploit the email channel are, notably, aspects in which the brands have made the most improvement. 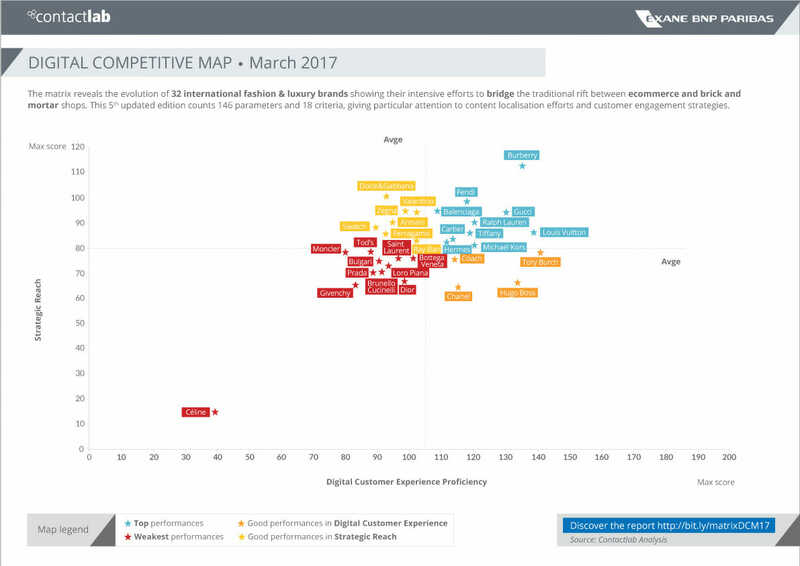 In the Digital Competitive Map 2017, Burberry confirmed its digital leadership while Louis Vuitton and Tory Burch were at the head of the Digital Customer Experience axis. The brands which made the most progress were Fendi, Michael Kors, Dolce & Gabbana, Ferragamo, Hugo Boss and Chanel. The report includes an entire section dedicated to different customer care management methods (including chat, telephone, email, Facebook and Twitter) and to customer feedback. For example, a few brands have really gone beyond, and offer real style consultation with the consumer, exchanging pictures, advice and opinions on the best ways to match the clothing with accessories. The full version of the report includes all conversations between our and the style advisors. On the other hand, the report also lists the brands which, unfortunately, let requests for assistance through various channels fall through the cracks. This year the map is available in a premium version, reserved for the fashion and luxury industry, that offers . Why opt for the full, paid version? Here are a few of the benefits of the complete premium report: ask for your copy and measure how you stand among your competitors.